I’m going to give you the same advice I gave the other person with a thin, picky eater: invest in a HayGain Steamer! You’ve already tried a supplement with fenugreek in it to tempt her with a maple/vanilla aroma (the SmartGain 4). How about a weight gain supplement that’s purely fat, or a weight gain supplement that’s purely protein (amino acids)? I find that horses respond very individually to different brands within the same category (weight gain) so don’t hesitate to experiment with some other products. Another suggestion is to play with her forage. Interestingly enough, turns out easy keepers LOSE weight with small hole hay nets while hard keepers, like yours, actually GAIN weight. There’s something about a constant source of forage trickling through their digestive system that seems to regulate or normalize horses’ weight. If you haven’t tried alfalfa hay, cubes, or pellets with her, they’re also a great way to increase appetite and add weight to horses. As the previous question and answer mentioned, soaked beet pulp is another way to encourage horses to eat and to get calories into them. Beet pulp is a complex carbohydrate or fiber that is fermented by the good bugs in the hind gut or large intestine (cecum and colon) into readily available energy/calories. Research suggests the fermentation process might be enhanced with the addition of active live yeast such as Saccharomyces cereviseae. That is, supporting her with a digestive supplement may help her get more nutrition out of the food she already consumes. Besides yeast, you’ll also find probiotics, prebiotics, enzymes and other ingredients in this particular category of supplement. Hi Michelle, thanks for your comment. 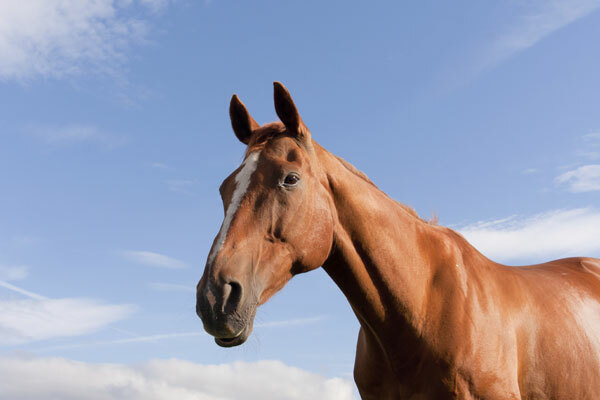 We’re sorry to hear that your horse isn’t feeling well! Our recommendation is to have him seen by a veterinarian as soon as possible since he is exhibiting some of the signs of colic. Your vet will be able to recommend the best course of treatment. We hope he is feeling better soon! I got my picky very underweight Oldenburg mare to eat by changing her grain to Triple Crown Complete, adding a cup of soaked beet pulp, and mixing in 2 quarts of warm water to make a nice warm mash. She LOVED it! She has since put on almost 200 LBS! She has filled out very nicely. I added other fats over a VERY slow time, like Hulleus oats, and rice bran. She loved the Hulleus oats, but wasn’t fond of the rice bran unless it was mixed in the hot mash. After she put on a good amount of weigh, I backed off the oats, and rice bran, and added Omega Max Triple Crown Golden Ground Flax. She LOVES to eat, and gets plenty of good fat Omega 3,and 6. The Omega Max is 34% fat, so be careful how much you give in a day. I give her 4 ounces Am, and PM. ( about 1/2 cup AM & PM). I since acquired a VERY thin TB mare who was very food aggressive and pretty much starved. I have over a 2 month time have done the same diet with her. She has put on 75 LBS! Her food aggression has subsided as she is becoming nutritionally complete. Both mares are also on a Pre/and Probiotic supplement. The TB mare had chronic digestive problems ( frequent cow pies) and was very cranky. Since adding the PRE/PROBIOTICS her digestive problems have greatly improved and she is very relaxed, happy and way less cranky. Also I only feed 3 1/2 lbs of grain to the 1250 lb Oldenburg, and 3 1/4 lbs to the TB AM & PM, and PLENTY of good quality hay! I prefer to only feed emough grain to get the right amount of vitamins, and minerals, rather than give large amounts of grain. I hope if you try these diet suggestions I mentioned works for your horse if you decide to try them! GOOD LUCK!